Our founder Cat Hobbs was on the radio this morning talking about public ownership of water, energy and the railways. She was up against former chief executive of Npower, Paul Massara, with Stephanie Flanders hosting. The debate covered the failures of privatised water, how much shareholders would be compensated if it was brought into public ownership, and what we should do about the potential effect on pensions - on which, more below. Is the debate shifting on the failures of privatised water? What is a fair level of compensation for water shareholders? Bringing water into public ownership would save us £1.8 billion a year on shareholder dividends alone. So, if we compensated shareholders for £18 billion, this proposal would pay for itself in around 10 years. But what about the pension funds? In the interview this morning, Stephanie Flanders was right to raise the question of the impact on pension funds of compensating at less than the market value of the shares. Pension funds own only 3% of shares of UK quoted companies. Therefore, we could have a special provision for dealing with UK pension funds - to make sure that people's pensions aren't affected badly by bringing our water into public ownership. At the moment, our water bills subsidise unaccountable investors in Australia, Canada, Malaysia and Hong Kong. This doesn't make sense. Water is already publicly owned in Scotland, while in Wales there is a not for profit water company. Worldwide, 235 cities have taken water into public ownership in the last 15 years, many of them in France and the US. Let's copy these great examples and bring water in England into public ownership. It is obvious that water is a national asset used by all should be nationalised for the benefit of all in lower bills, not for share holder benefit. the issue of compensating the shareholders may be a simple one - original price paid plus inflation over the years but why not simply bring out special tax rather than full scale privatisation? I worked for a water company for over 30 years and have seen the difference between public and private ownership. During that time there has been very little improvement in service and the condition of the asset has certainly been allowed to deteriorate and baring in mind that water company's were privatised with almost zero dept and private companies allowed to increase prices in the first five years by inflation plus 5% to pay for investment, not forgetting that water companies were already investing considerable amounts of capital but having to make sure that there was no dept at the time of privatization whereas that investment would normally be spread over 30 years plus? They have made all the profit they deserve no more. Stop the rot. Let them reduce the debt before receiving a single dividend more. 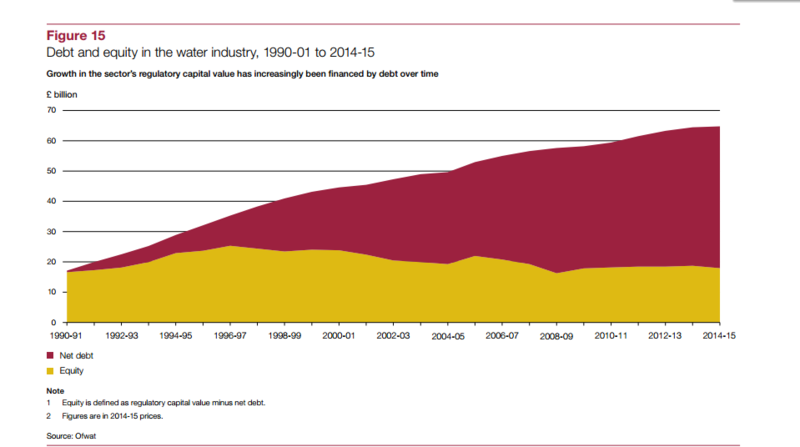 The water companies owe 42bn so are worthless buy them for one pound. I agree. They've asset stripped almost everything they could sell, including 1 000s of hectares of prime building land which went to their chums' Land Banks. As part of the recovery of our "stolen goods" there should be a forensic examination of ALL financial transactions of the Spivs who have been creaming off OUR cash before a penny piece is paid to share-holders. I really can't see why tax-payers should want to take on the risks and liabilities of businesses such as these. If one feels they make excess profit, then tell OFWAT to regulate the industry differently. If nationalisation was so good, just remember the UK back in the 1970s. I really wish I didn't have to bellyache on this subject, but I will. There is one reason, and one reason only for buying into the privatisation of public services. Believe when I say, it has absolutely nothing to do with improvements to the already existing service. It's purely for how much money the can drain (pun intended) out of the public coffers. I find it very difficult to pinpoint any public service, utility or amenities. That has improved in any major way since being privatised. In most cases the total opposite higher prices, poor quality, more debt. As they pay out massive amounts to shareholders management bonus and pension funds. With the loss of revenue this creates higher tax rates, so you lose on both counts. We wouldn't have had these assets EG. Reservoirs if had not been for the foresight of the Victorians through the Councils of the various large cities, which provided clean water for their citizens. For the Government to sell off these assets was a disgrace. Directors in companies providing services to the soon-to-be-privatized water companies were strongly against privatization for all the above reasons. They could do nothing to stop the tide. They were right!